The scariest thing about Inmates is its lack of a sprint button. A horror game with few scares, Inmates is imprisoned by its lack of ambition. What is it? A horror-themed walking sim. Inmates begins with some cool dream imagery that has nothing to do with the story at all, and will never be referenced again. When it’s over the protagonist, Jonathan, wakes up in a prison with no memory of how he got there. He quickly discovers the horrifying truth: he’s trapped in a videogame with a lot of long corridors and no sprint button. It’s hard not to be glib about a game that makes so few attempts to be interesting. Sure, as I explored Jonathan’s prison I found the Zodiac killer’s alphabet, references to the Heaven’s Gate cult suicide and demonology, but nothing came of any of it. 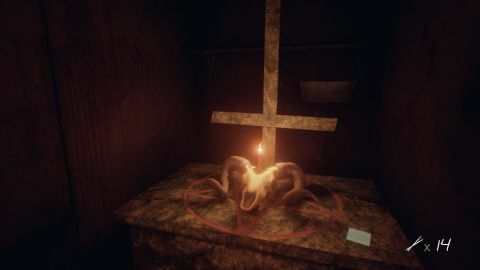 Inmates is another horror game full of Biblical verses proclaiming doom and gloom, though it does subvert that cliche by being devoid of any religious insight. Jonathan’s predicament has no relation to any religion, nor do the motives of his enemies. Inmates has one meaningful reference: nearly every character’s head blurs back and forth in a clear nod to the film Jacob’s Ladder. It’s the scariest thing in the entire game, which isn’t saying much. Around 15 minutes in, it becomes incredibly obvious that the prison is inside Jonathan’s mind, and that the man masquerading as his doctor and the ghostly prison guard keeping him in are just other aspects of himself. It’s a premise that has been explored countless times before in films displaying variety and intrigue that's lacking here. The rest of the story is an exercise in tedium as Jonathan meanders through his mind-prison, solving easy puzzles while the voice pretending to be his doctor gives him his objectives that amount to "find keys" or "go somewhere." I’m no great puzzle master, but I never found myself troubled by Inmates’ puzzles. Once, I was floating in a room. In the middle was a door, and beyond the door were four levers. All I had to do was memorize the symbols on the door, then move the levers until I had found the matching symbols, and the door opened. That was the hardest puzzle in the entire game, but only because I didn’t immediately spot the levers. The level design makes no attempt to reward exploration, because the bulk of Inmates takes place in a single square cell-block, gated by actual prison gates which require keys or scripted encounters to pass. Walk forward, open a cell door, read the note inside, step out, walk forward, and open the next cell door. Repeat until you’ve traversed the length of the cell block. Occasionally, you’ll see spooky cliches painted on the wall, like "Home Sweet Home," or get trapped in a cell, which you can leave when you solve one of Inmates’ simplistic puzzles. Inmates is eager to give its players matches, but they’re not worth using. In a game like Amnesia, which Inmates seems desperate to imitate, light sources serve as a way to retain your sanity, making them meaningful. Inmates is not so clever—its matches are so bright that they make it harder to see the rest of the screen. Mechanically, Inmates has very little going on for it. The lack of a sprint button seems to be a remedy for a bigger problem: an absence of any meaningful interaction. Aside from solving a few puzzles, Jonathan spends all of his time walking and backtracking. The fearsome Roy, one of Jonathan’s other personalities, shows up at intervals to appear menacing. Roy scares Jonathan, but for players, his presence signals little more than story progression. With no mechanical or narrative depth, Inmates has little to offer. I completed the game, unlocking every achievement, in a single 90-minute playthrough. Performance is acceptable for an Unreal 4-powered game, aside from the occasional minor stutter, and I experienced no major crashes or noticeable bugs in the 90 minutes it took me to complete the game. Unfortunately, the options menu leaves a lot to be desired. When it comes to graphics, Inmates features the typical low, medium, and high graphical presets, as well as options for Vsync, brightness, and motion blur, but nothing beyond that. If there’s a way to change the resolution, I haven’t found it. There is no way to rebind keys, though you can change look sensitivity and invert the mouse. Inmates’ biggest shortcoming is that it's aggressively uninteresting. Rather than attempt a fresh take on worn-out tropes about dissociative identity disorder, Inmates repeats what came before. References are made because they’re assumed to be scary, but they rarely matter. Inmates has few scares or surprises to offer.